I have managed to overcome many culinary aversions, from pickles to tripe to testicles (a story for another post), but kimchi was something that I refused to eat. I was first exposed to the stuff seventeen years ago, and it was not a pleasant experience. I was working at what would be my last biotech job (also a story for another post), a drug discovery startup that had organic chemists synthesizing drug variations on one side of the building, biochemists (like me) testing the new versions in different in vivo systems (cell culture, mice, rats), and the mouse facility in the middle. We were all used to mice dying on us over weekends while we were away – it happens, mice don’t live very long. Consequently, the biochemists all became inured to the smell of dead mouse, which we occasionally smelled when the lab doors were opened into the main hallway. One day the smell was particularly overpowering, as if deceased mice had been neglected for more than a week. I asked “What the hell died in here, and why hasn’t it been dealt with?” I was informed that no mice had died. Hyo was one of the chemists; I learned that he ate kimchi with his lunch at least once a week. I have never been able to dissociate that smell from the food, but had managed to avoid the stuff all this time. Last week, in order to make a much more elaborate recipe from Momofuku, I was forced to face my fear. And if I had to use it, I would go all out and make my own rather than buying a jar from among the myriad varieties ranked along an entire wall of my local Asian market. The recipe is simple. 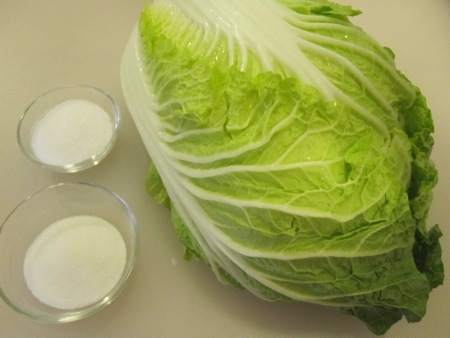 I started with a medium head of Napa cabbage, two tablespoons of kosher salt, and two tablespoons of sugar. 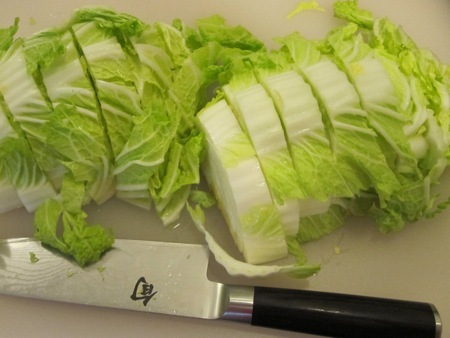 I cut the cabbage in half lengthwise, then cut the halves crosswise into one-inch pieces. 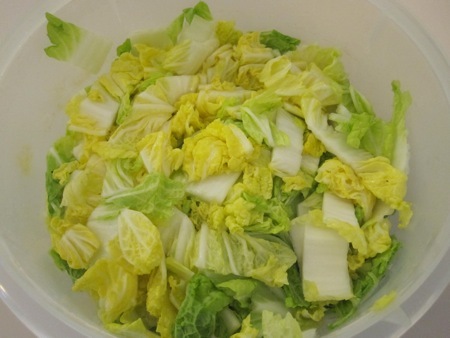 I tossed the cabbage with the salt and sugar, then let it sit overnight in the fridge. The next day I drained the excess liquid from the cabbage and returned it to its bowl. 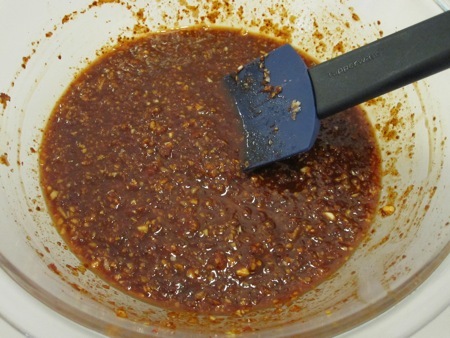 Kimchi is a fermented pickle, so the next step is to make a brine. 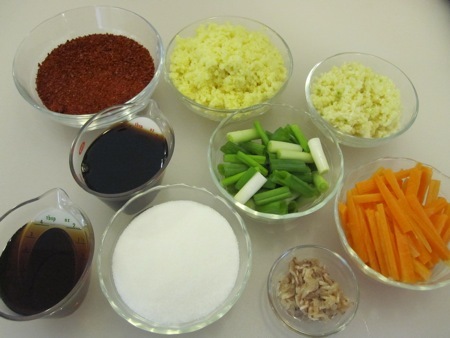 I assembled a half cup of sugar, twenty minced garlic cloves, twenty minced slices of peeled fresh ginger, a half cup of kochukaru (Korean chile powder), a quarter cup of fish sauce, a quarter cup of light soy sauce, two teaspoons of salted shrimp (found in jars in Asian markets), a half cup of scallions cut into one-inch pieces, and a half cup of julienned carrots. I mixed everything together, forming a thick sludge which I diluted with a third of a cup of water. I added the brine to the cabbage, along with the scallions and carrots, and tossed to coat. Before covering the container and placing it in the fridge, I gave it a taste. Fresh kimchi tastes like very spicy newly-pickled vegetables, not at all what I had expected. Of course, the fermentation would begin in a few days, reaching its peak in about two weeks when the bacteria started generating CO2. Until then I had something I could work with in six days. Until then, like Cthulhu, the kimchi waited, fermenting. Oh boy. How is the fridge smelling now? I’ve been very weary of trying my hand at Kimchi from Momofuku or anywhere else (even though I love it at Korean restaurants) because it supposedly stinks so bad when fermenting in the fridge. According to a few Korean friends I have, Koreans usually have a seperate “Kimchi Fridge” just for all that stinky stuff. The kimchi is only 12 days old. 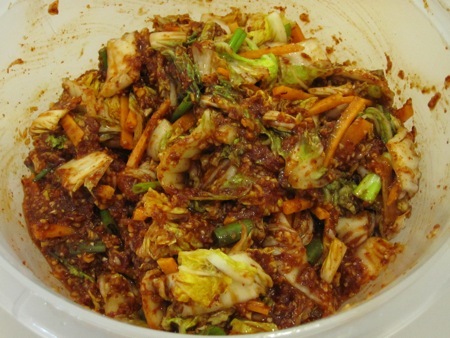 I keep it in am airtight Tupperware container that I was willing to dedicate to kimchi storage. I check it every other day to vent the container; thus far it doesn’t smell bad at all. I don’t plan on keeping it long enough to learn just how bad it can get.